Magnetic Tape Recorders and Reproducers - "Recording with Tape"
Magnetic tape was invented for recording sound by Fritz Pfleumer in 1928 in Germany, based on the invention of magnetic wire recording by Valdemar Poulsen in 1898. In 1933, working for AEG, Eduard Schuller developed the ring shaped tape head. Previous head designs were needle shaped and tended to shred the tape. An important discovery made in this period was the technique of AC biasing which improved the fidelity of the recorded audio signal by increasing the effective linearity of the recording medium. Due to the escalating political tensions, and the outbreak of World War II, these developments were largely kept secret. Although the Allies knew from their monitoring of Nazi radio broadcasts that the Germans had some new form of recording technology, the nature was not discovered until the Allies acquired captured German recording equipment as they invaded Europe in the closing of the war. It was only after the war that Americans, particularly Jack Mullin, John Herbert Orr, and Richard H. Ranger were able to bring this technology out of Germany and develop it into commercially viable formats. A wide variety of magnetic tape sound recording equipment and formats have developed since, most significantly reel-to-reel audio tape recording and Compact Cassette. "3M's Mincom division introduced several models of magnetic tape recorders for instrumentation use and for studio sound recording. An example of the latter is the model M79 recorder, which still has a following today. 3M Mincom was involved in some of the first digital audio recordings of the late 1970s to see commercial release when a prototype machine was brought to the Sound 80 studios in Minneapolis. After drawing on the experience of that prototype recorder, 3M later introduced, in 1979, a commercially available digital audio recording system called the "3M Digital Audio Mastering System”, which consisted of a 32-track digital audio tape recorder and a companion 4-track digital recorder for final mastering. 3M later designed and manufactured several other commercially available models of digital audio recorders used throughout the early to mid-1980s." "Alexander M. Poniatoff founded Ampex in 1944, primarily to manufacture small motors and generators for military applications. When WWII ended, the military contracts dropped off, and Alex had to search for a new line of business to continue his company’s existence. He and his small group of engineers heard a demonstration of a Magnetophon, a German magnetic tape recorder used by Hitler during WWII. The demonstration quickly convinced Alex to redirect his company and soon it was designing and manufacturing professional-quality magnetic tape recorders. Bing Crosby was a great help in Ampex’s early years. The company grew quickly and, within a short time, dominated the magnetic tape recorder market in radio, television, the record industry, and industrial and military markets for instrumentation recorders"
Magnecord was a U.S. based tape recorder manufacturer. During the 1950's Byer Industries, in Australia, manufactured some models of the Magnecorder under license. Byer Industries Pty. Ltd. were granted the exclusive manufacturing rights of the American "Magnecorder" for the sterling market. The new product would soon be available alongside the company's already familiar BRS disc recording products. A feature of the Magnecorder is high quality combined with portability and adaptability. Music Center Incorporated (MCI) is the former name of a United States manufacturer of professional audio equipment that operated from 1955 until 1982 when it was acquired by the Sony Corporation. The company is credited with a number of world firsts: commercialising the 24-track multi-track recorder, the tape AutoLocator and in-line mixing console. MCI's reputation was built on technical innovation and its budget priced systems that were especially popular with independent music studios during the 1970s. At the height of MCI's success, one third of record albums on the Billboard 100 at the time were alleged recorded on MCI branded mixing consoles. "Otari has been a leading manufacturer of professional audio products for the music recording, broadcast, post-production, film and live sound markets, of products such as; analog and digital recorders, mixing consoles, plus high-speed industrial audio and video cassette loading and duplication systems." Foundational text courtesy of Otari, Inc.
"ReVox is a brand name of Swiss audio equipment registered by Studer on March 27, 1951. The first Studer-designed tape recorders were branded Dynavox. After the first production series of Dynavox recorders, a new marketing company was formed in 1950 called ELA AG. Revox was adopted as the brand name for amateur recorders, while the professional machines retained the Studer name. The first Revox-branded tape recorder was the T26, in 1952, successor to the Dynavox 100. The T26 was also made available as a radio-recorder combination unit. 2500 T26 recorders were made, priced at 1395.00 Swiss francs." "Stephens recorder/reproducers are designed and built to uncompromising standards. The key to Stephens' top performance at competitive prices is our no-nonsense approach. We appreciate the unique requirements of audio professionals, and audio pros will appreciate what we have to offer. Sound interesting? Hearing is believing!" Studer is a Swiss manufacturer of professional audio equipment, founded in Zurich in 1948 by Willi Studer. It is known primarily for the design and manufacture of analog tape recorders and mixing consoles. Studer also produce other technology solutions, such as telephony management systems and radio broadcast studio equipment. Studer originated the consumer brand Revox, but sold the group to private investors in 1990. Studer's analog tape recorders are widely considered to be the best in world by Audio engineers due to their excellent reliability and sound quality. The company has built a variety of two-track recorder models throughout its history for stereo recording and mixing. 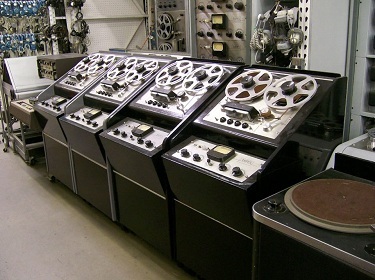 One of the company's most successful models was the Studer-Revox A77 recorder, which was introduced in 1967. It sold over 400,000 units. Studer was also an innovator in the design and production of multitrack recorders. The model J37 four-track recorder was used to record the Beatles renowned Sgt. Pepper album in 1967. Later Studer multitrack recorders were built in eight-, 16-, and 24-track configurations. With the addition of SMPTE time code multiple machines could also be linked together, making the number of available tracks virtually unlimited. Sales of these analog machines continued to be strong into the early 1990s when they began to be replaced by digital recorders. Studer was acquired by Harman International Industries in 1994 and is operationally controlled by its UK-based sister company Soundcraft. John Alcock, Robin Bransbury and Tommy Thomas were young and enthusiastic engineers who met while working for the long established British audio firm Leevers-Rich. They saw the opportunity that the new and growing multi track market offered and approached their former employer with the idea. Foundational text courtesy of Bill Todd. Do you have content, to add, about Magnetic Tape Recorders and Reproducers - "Recording with Tape" or associated topics? Please feel free to Share it, here! What other Visitors have said about Magnetic Tape Recorders and Reproducers - "Recording with Tape"